We have been fishing out of the port of Fair Haven for several years now. 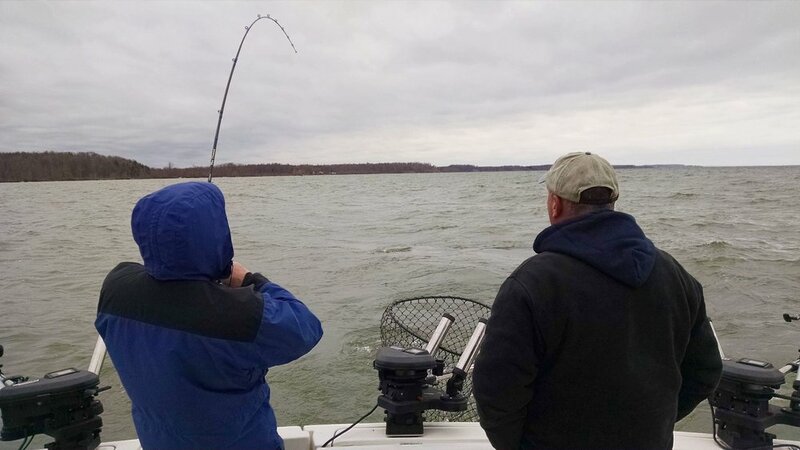 Well known as one of the best locations for the spring brown trout season and the summer salmon season, Fair Haven also boasts some of the finest smallmouth bass and walleye fishing available. "Popeye" is a 30' Tiara Yacht. With over 11' of beam it provides plenty of room to fight your trophy fish. It is powered by twin 454 fuel-injected engines that have plenty of power to get you to and from the fishing grounds fast, providing you with more time to fish. It has all the comforts of home with a full standup head. Equipped with the latest electronic like, Fish Finders, GPS, Marine Radio, Forward looking Sonar, Chart, Autopilot, Radar and Scotty Downriggers. "Popeye IV" is a May-Craft center console, 200 hp outboard fully equipt, groups to 4 persons.